Lady Gaga (also known as Stefani Germanotta) says she is terrified of being a mother as she fears that having children will ruin her creativity. “Yes, some day (I want to have children). Although my womb is not yet beckoning for a child. I’m very far away from that day. I’m also terrified it will ruin my creativity,” contactmusic.com quoted her as saying. The statement gave me pause for a moment (I mean even apart from wondering if anyone's womb ever beckons for a child and how much creativity is involved in p-p-p-p-poker face lyrics). Does becoming a mother make you less creative? After thinking about it for a while, I think it all comes down to time and energy. Not beckoning wombs. I think if you're creative, you're creative - with or without children. As a parent, I've been creative in different ways. I've had less time to write. (I almost didn't write this blog entry because I knew it would take a while.) I spend more time in carpool lines and at baseball games. But I still feel creative. Perhaps it's because, as Aldous Huxley said, the secret of genius is to carry the spirit of childhood into old age. Having kids around you all the time makes that much easier! Take the Crayola Color Quiz to see how many you remember! Some of the best advice you’ll ever get may come from a cookie. Who amongst us does not have an old tattered fortune that we carry around in our wallet or keep pasted to the front of our refrigerator door? Now all those fortunes with “personal significance”, finally have a place worthy of their “take-out wisdom” to reside. Paste your favorites in this Fortune Collecting Journal, jot down whatever insight it may have inspired when first read, and create your own lucky little keepsake. Journal also includes descriptions of the animal symbols in the Chinese Zodiac. Ernest Hemingway was once prodded to compose a complete story in six words. His answer, personally felt to be his best prose ever, was "For sale: baby shoes, never used." Joe - and Alexander Liberman - reminds us that creativity without waste is impossible. And, interestingly, sometimes the waste is more than just an afterproduct - it spawns a whole new idea altogether. The waste, in effect, becomes the creativity. Burkhard Bilger writes of many of these unhappy happy accidents in the chemistry lab (The New Yorker magazine, May 22, 2006). Shashikant Phadnis, a young Indian chemist at Queen Elizabeth College in London was instructed to test a new compound - but he heard "taste the new compound" and found it achingly sweet. That compound in its pure form is the sucralose, also known as Splenda, that we stir into our coffee, tea and Kool-Aid today. When Columbus introduced cane to the New World, the anthropologist Sidney Mintz has noted, sugar was an exotic luxury. Most Europeans had never eaten sugar, but they quickly developed a taste for it. By 1700, the Americas had become a vast sugar mill and the English were eating four pounds per person per year. By 1800, they were eating 18 pounds; by 1900, 90 pounds. But nowhere was the rise of sugar as dramatic as in the New World. Last year, the average American consumed about 140 pounds of can sugar, corn syrup and other natural sugars - 50 percent more than the Germans or French and nine times as much as the Chinese. Saccharin was found over dinner in 1879 by a chemist who was working with coal-tar derivatives and forgot to wash his hands properly. Aspartame was founded in 1965 by a chemist who was testing new drugs for gastric ulcers and licked his fingers before picking up a piece of paper. I didn't know either that cats can't taste sugar - neither can many dogs, he says. Most other animals can't taste artificial sweeteners. Lust for sugar seems to be a basically human trait. Newborns are already fixated on sweetness. Sugar seems to trigger the release of opiates in the brain, bringing pleasure and blocking pain. Americans ate about 24 pounds of sugar substitutes per person last year, nearly double what they did in 1980, yet sugar consumption rose about 25 percent in the same period. The calendars are $14.95 and are available online here. 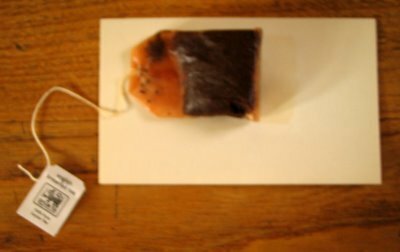 Communication Nation has an interesting exercise to help us use random patterns for inspiration - and it involves a tea bag, which I have every afternoon anyway, so I might as well put it to good use. 1. Eat paste. Practice using all your senses to solve problems. 2. Run with scissors. A sense of urgency may be just what you need to get things done. 3. Don't sit still. Explore new environments. Get out of the office (or the house). 4. Color outside the lines. Look for opportunity in the white spaces. 5. Question everything. Ask why, over and over and over. 6. Play with matches. Take a risk. You might be surprised. 7. Follow your whim. Allow yourself to rediscover wonder. 8. Get lost in your imagination. When you stretch yourself, there's no limit to what you can do. 9. Play games. Let yourself laugh so hard milk comes out your nose. 10. Take naps. Rest more so you can think fresh thoughts. My best ideas come to me walking, driving or in the bathtub. Maybe it's something about being away from any practical way to get the ideas out that make them spring forth. I keep a notebook in my car for the ideas while driving, but I haven't fixed the problem while walking or in the bathtub. But now I can scratch one more off the list. Alex Hart, president of ATP Solutions, a fellow aquatic thinker, recommends the Innovative Jumbo Dive Slate as a solution in Business 2.0. 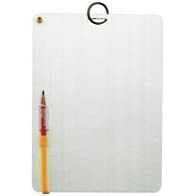 The boards are used by scuba divers to take notes underwater. You can find them at dive shops or even at Amazon.com.